Looking for the Best Four Person Tent? Out of the five camping tents we reviewed, we believe that the CORE Equipment Four-Person Instant Dome Tent is the best four-person tent on the list. Not only does the tent have all the basics, but it has extras such as easy setup and break down and the H2O blocking technology. These give the product that extra "boost" it needs to stand out from others on the list. It's reasonably priced, and you can tell that the construction of the tent was done with skill and dedication. Although it can't stand up to all weather, most people aren't looking for tents to go on an expedition. 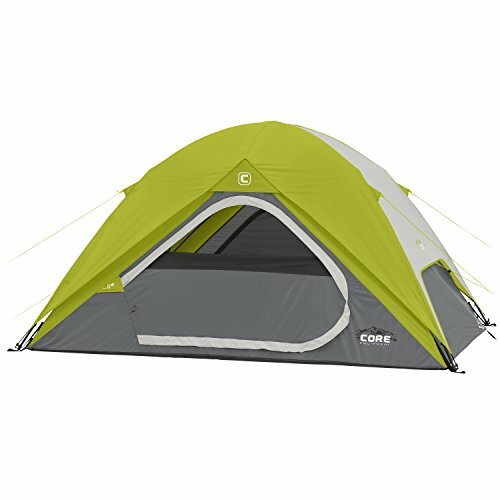 The CORE tent provides them with what they need. Camping is one of the most fun pastimes of all. Becoming one with nature can be a welcoming experience, especially if you are trying to get away from a busy, stressful life. While enjoying all that nature has to offer, you'll still need a place to rest. Tents provide you with portable shelter that gives you the privacy and security you need when you get tired from all that nature-bonding. There are many tent brands that you can choose from and everyone has their opinion of what defines the "best tent". In this guide, we discuss four-person tents and what criteria you should prioritise for your own personal situation. First, we will provide you with the information you need to choose one, and then we'll give you five suggestions on some of the best ones. While tents sort of look similar to the first known tents back in 40,000 BC (especially in shape), they are very different. Tents have come a long way since the "animal skin on Woolly Mammoth bones" days. They have evolved into lightweight, portable, structures that come mostly ready to "pop up." They can keep you temperature-moderate, comfortable, and safe from different types of extreme weather and seasons. There are a lot of features to consider while shopping for a tent. To choose the right one for your camping trip, you'll need to know some tent basics. Below is some important information about features that is definitely "need-to-know" before buying a camping tent. Tents come with a seasonality rating which tells you what type of weather it can stand up to. On average, they range from one season to five seasons. It's important to remember that the season rating doesn't necessarily dictate the quality of the tent, but rather the usefulness of the shelter. With this being said, it's only logical that a tent meant to stand up to harsher weather will be of a higher quality, but that doesn't mean that it's the best one for your needs. These are usually the most lightweight and most inexpensive tents available. They aren't perfect for standing up to any weather harsher than light rain. One or two season tents usually have the specific purpose of keeping campers cool in the summer, so they don't have very much insulation or extra features. One and two season tents are the tents you'd find in a bargain department store. They may be advertised for kids or for families who want to have some backyard fun. Many times manufacturers don't put the rating on these types of tents. If you come across a tent and you can't find the seasonal rating on it, it's probably a one or two season tent. These tend to be the most popular among campers. They tend to be the porridge that's "just right." These tents are great for use in spring, summer, or fall and can handle heavy rain reasonably easily. The higher-end three season tents may even be able to protect you from light snow. They aren't suited for extremely harsh weather such as storms. They are ventilated with a lot of mesh material and also insulated so it can keep you warm in cold weather. They usually have rain-flys (discussed further below under customizations). While the mesh material will do a great job of keeping bugs out while still providing you with ventilation, it may not be the best choice for a campsite where a lot of sand or dirt will be blowing around. There are also extended season tents, also called 3+ season tents. These tend to be more durable, have more poles, and can stand up to slightly harsher weather. They can be a bit bulkier and may have less mesh. Four season tents can withstand some of the harshest weather. If you plan to sleep in high-elevated areas with severe winds and inhospitable weather, like the mountains, for example, you'll want to get at least a four-season tent. Not only are these tents way more durable than extended season tents and below, but they are also extremely insulated. They have rounded tops to discourage snow collection on top of the tent. You may be wondering if these tents are so much better, why wouldn't you choose this one, to begin with. Although four season tents are a better quality tent, they aren't suitable for every situation. One reason is that since they have very little ventilation. This means that you'd be baking in the summer heat because they are specifically designed to keep heat in. Five season tents are basically like four season tents, but much more durable for the coldest, most extreme, rough weather. These tents are sometimes called expedition tents because they can withstand just about anything. Okay, maybe not a hurricane, but close to it. Five season tents are serious overkill for a simple hiking trip, but if you are going to be in a harsh environment like the Arctic, then you'll want a five-season tent. The most important feature of these tents is to keep you warm. That means if you try to use a five-season tent in any other scenario than a snow-capped mountain or the blistering icy wind, you'll probably get too hot. The most popular range for tent capacities ranges from two-people to eight people. When considering the sleeping capacity of a tent that you want to buy, you need to think about more than merely how many people will be in the tent. For starters, when at full capacity, most tents will be a tight fit. A four-person tent will leave little room to move around if you have four people in it. You'll probably be sleeping right on top of each other. Looking for a Bigger Tent? You also need to consider the fact that you'll need room for gear, pillows, blankets, pets if you have them, and other items you may want to put into the tent. Consider getting a tent capacity that is at least two more than the number of people that will be sleeping in it. This will give you a bit of extra room to spread out and get comfortable. This is especially important if you are a bit on the large side. You may be more comfortable if you have extra space. Tent fabric is measured in deniers (D). Deniers is the unit of measurement used to indicate the thickness of the individual fibers that create the material. Microfiber fabrics are less than 1D. By contrast, a human hair is around 20D. The higher the denier, the more durable the fabric is. Cotton Canvas - not really popular anymore. Also not waterproof. It is great for all temperatures. Polycotton Canvas - the only difference between this and cotton canvas is that this isn't 100 percent cotton. It's a mixture of fabrics and tends to be lighter than 100% cotton. PVC-Coated Cotton Canvas - this makes a canvas cotton tent waterproof but may cause condensation to collect on the coating. However, it's suitable for large tents. A bit heavier than other fabrics. Polyester - can have a variety of coatings. One of the most popular fabric tents. More durable than nylon. Nylon - usually coated with acrylic, silicone, or polyurethane. Used mainly for small tents and cheap tents. Very lightweight. Peak Height - you may want standing room, or at least sitting room. Ventilation - without it, you could get very hot in the tent. Size - make sure you get a good size to fit everyone in your group. Remember, some people are larger than others. Number of Tent Poles - in general, the more tent poles, the sturdier the tent. Extra Attachments - things like gear compartments and loft hooks can help out a lot. Accessories - accessories like bags or complimenting sleeping bags make your tent that much better. Coleman is a popular brand when it comes to camping equipment. The Coleman Sundome tent is one of their best two-season tents on the market. It's extremely lightweight. At only three pounds, it is easy to carry this tent wherever you need it. It's easy to set up and easy to take down and comes with a handy carry bag that allows you to transport your tent easily. This tent stands out from other two season tents due to the exclusive WeatherTec technology. This means that Coleman has made this tent "extra" waterproof. The seams are inverted to hide the needle holes from the rain. The floor of the tent is made with "welding-inspired" manufacturing and is waterproof. It has a freestanding fiberglass pole system that is designed to withstand winds up to 35mph. There are a couple of drawbacks to this tent. For one, the storage compartment is tiny. It's only big enough to store keys and a wallet, or maybe a small flashlight. The WeatherTec technology makes this tent great for rain--you don't even have to worry about getting wet from sleeping on the tent floor. The tent is very lightweight making it great for kids to handle. It has large windows, great ventilation, and a ground vent that keeps warm air moving upward to keep you fresh in summer. You can set the tent up relatively fast, in about ten minutes. The tent is not suitable for cold weather since it isn't insulated. This tent does not stand up to wind very well. It's only suitable for light wind/breezes. 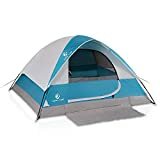 If you are looking for a good, inexpensive tent to keep you dry, this is an excellent tent to consider. If you're looking for a heavy-duty tent to get you through some severe weather, check out this mountaineering tent. It's great for just about any type of weather, including heavy rain or snow. The tent is made of a high-quality polyester material. Even the rainfly is tough--its made of 75 denier polyester and has a 1500mm PU coating to make it waterproof. The surface also resists UV rays, so your tent won't fade or wear from sun exposure. The tent is insulated and has several mesh windows for ventilation, including a star-gazing top mesh window. Two doors allow easy access, and each entry has a mesh window for extra ventilation if you need it. The best part is that it is relatively lightweight for a 4-season tent, so you can easily carry it with you when hiking and camping. The tent is a bit on the expensive side, but this is to be expected with a four-season tent. It's affordable when compared to other four season mountaineering tents. In any case, it's a pretty good investment if you need this level of protection in a tent. It has a large gear storage area that saves valuable floor space. The floor is made from a 75D poly taffeta. It has a large, top-quality #8 zipper that is easy to zip and unzip. It comes in different, stylish color choices. The fiberglass poles are what keeps it from being labeled as the best four-person tent. While fiberglass is durable, it doesn't hold up to strong wind as well as aluminum poles. It's a little smaller than the Coleman, so space is also a bit of an issue despite having a separate gear compartment. If you're going to be in a wet environment, we would recommend that you consider this tent for its water-repelling properties. Amazon entered the manufacturing industry and hit the ground running. Among their sea of products is this 3-season, four-person tent. It's made of a 100% polyester fabric, and like most four-person tents, it can fit a queen-size bed inside. One cool feature of the tent is that the rainfly creates an awning of sorts. This awning is excellent for providing you with shade in the sun. There are a few downsides, but nothing that makes the tent a complete deal breaker. The tent comes in one bland color scheme (orange and brown) which is good for practicality, but not for personal tastes. It makes it look more like a work tent than something for leisure. The tent only has a tiny storage compartment that's good for keys or cellphones, so you may have to use floor space for your gear. This isn't a deal breaker unless you want a lot of storage space. It has an impressive 1000D floor made of polyethylene. The mesh material keeps out dirt/sand particles as well as bugs. It's water-resistant, not waterproof. This means that it might withstand light rain, but heavy rain is out of the question. The tent doesn't have very much mesh. Although it has a ventilation port, ventilation in this tent may not be as good as others. In the end, this is the best tent for someone who needs to save money and isn't concerned about a lot of fancy features. If you're looking for quality in every stitch, this tent may intrigue you. It is a 100% polyester tent with a lot of features you'll love. Upon inspection of this tent, it's clear that excellent craftsmanship went into manufacturing it. Features like inverted, taped seams set it apart from other shelters that are similar in size and price. One great feature of this tent is the gear loft. Many comparable tents have a tiny mesh storage compartment (such as the Amazon Basics tent), but the loft on this one is a great size that can save you a lot of floor space. 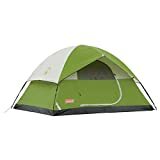 If you have a lot of gear that you need to keep inside the tent, this is an excellent tent to choose. On the downside, this tent is a bit heavy compared to other tents like this one. You may want to pick something else if you're going to be backpacking. Only takes about 30 seconds to set this tent up and/or take it down. The tent has an exclusive H2O Block technology that repels water. With plenty of mesh panels, the tent has adequate ventilation. It has a gear loft for storage and a hook where you can hang a lantern. The zipper, which is a high-quality zipper, is hard to zip and unzip. It tends to get jammed on the zipper cover. The legs are hard to snap into place. You have to put some muscle into it. If you like a tent that is simple to set up and take down, this may be an excellent choice for you. Here is another tent that is easy to set up. If you're looking for a lightweight, inexpensive two-season tent, then you may be interested in this one. While it isn't the most durable, it is good for the occasional camping trip in fair weather and light rain weather. It's also super affordable, so if you're on a budget, this might be the right tent for you. With the rainfly and mud mat, you have a lot of different types of protection to keep your tent comfy, dry, and looking its best. The mud mat is one feature that sets this tent apart from the others. It will help to prevent you from tracking dirt and mud inside. This tent is unique in the amount of mesh material it has. Having so much mesh makes it highly ventilated, so it's excellent for use in the summer when temperatures are high. It is also perfect for stargazing. Stylish and comes in different colors. Has a PU coating to repel water. The PU coating is anti-UV to help protect your tent from fading. Fiberglass poles won't hold up well to wind. The only mesh is on the door, so doesn't have good ventilation. If you are looking for the best hot-weather tent, then this is an excellent choice due to all the mesh on this tent. Want a quick and easy tent to erect? The pore over our best pop up tent guide. Which tent is the winner in the best tent for families category? Look no further for the best cabin tent! If you are looking to stay cool this summer, then consider some battery fans for camping in hot weather.